Veteran Latino Hip Hop artist Kemo the Blaxican is asking fans to participate in his new video for the song ‘5th of May’. The hip hop veteran says he wants people to show the world how they get down on Cinco De Mayo. The hip hop artist and entrepreneur; Kemo is also the owner of Dead Silence Records, a successful clothing line and Nightclub, wants you to send in your tapes of how you partied last year on Cinco De Mayo. If you don’t have footage of your ‘Fiesta’ from last year, then get your homies or homegirls together and record a Pre-Cinco De Mayo Party. 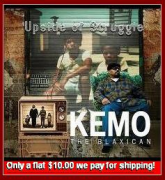 Sent the tape to Kemo and if your footage is off the hook, you have a greater chance to being hooked up in this video by the hip hop veteran Kemo the Blaxican. Kemo wants to show the world ‘how we get down Mexican Style’. Every one is invited and Kemo wants it all; from BBQ’s, Backyard Parties, House Parties, Car Clubs, Kids to Abuelitas Y Abuelitos (grandmaw’s and grandpaw’s) getting down. He wants it to be a ‘family affair’. Footage should be 15-20 minutes long and must be in the form of a VHS tape, Mini-DV or DVD. By submitting footage you are giving Kemo permission to use your footage/image(s) in the ‘5th of May’ music video. In order to release the video on Cinco De Mayo, ALL VIDEOS MUST BE RECEIVED BY APRIL 12TH. Join in with hip hop entrepreneur Kemo the Blaxican in this unique celebration of Cinco De Mayo. Also if you would like to celebrate Cinco De Mayo with Kemo the Blaxican, he will be at the Celebrity Theatre in Phoenix, Arizona for a Cinco De Mayo Celebration May 5th. Up a Notch Enternainment! Presents: Kemo the Blaxican - Hip Hop & Reggaeton Explosion with N.O.R.E. With: Rameses (WuTang Latino) Brisaye - Tont Haze Saturday May 5, 2007 Club Doors open at 6:30 PM Showtime - 8:00 pm. Tickets - In Advance Rows 1-13 $35.00 Rows 14-25 $25.00 Day Of All tickets increase $5.00 Seating is in the Round. All tickets purchased within 10 days of the show will be placed at will call. Tickets available at the Celebrity Theatre Box Office; to charge by phone call 602-267-1600 ext.1. Kemo would like to invite all to come Celebrate Cinco De Mayo with him and check out the new tunes and share in the good times.